A while back I made a bag for carrying stuff to guild meetings and used some scraps of Kraft-Tex to reinforce the base. I have enjoyed that addition, both because it helps the bag stand up on its own and because I don’t have to worry about putting the bag on the floor. 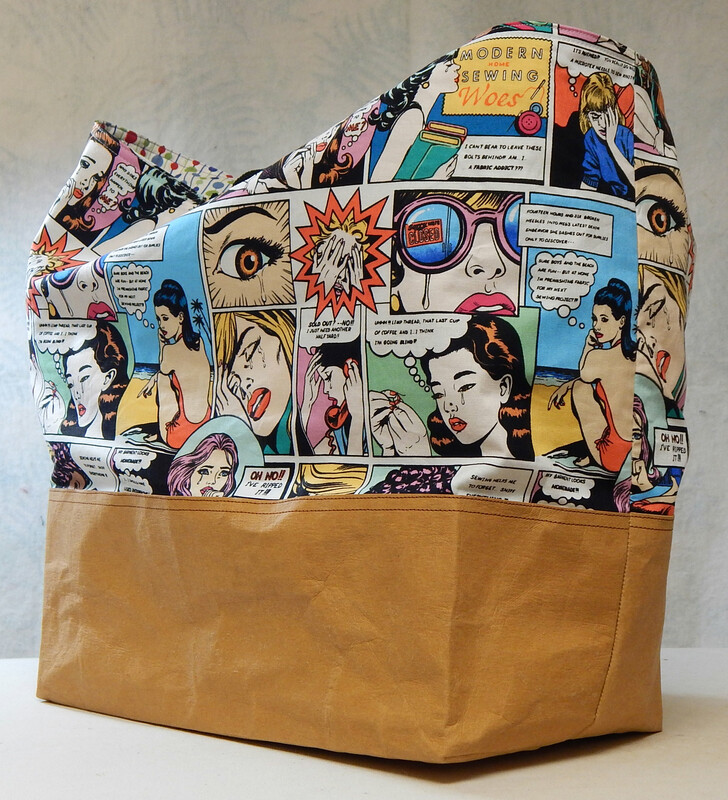 I decided to make another tote bag using this tutorial from Bijou Lovely Designs, Holly DeGroot’s blog. Her tutorial includes the free pattern, so go make it if you want to. Her instructions and illustrations are excellent. Here are my modifications for making the base of Kraft-Tex. Holly’s instructions used the same fabric for the bag lining and the base, so of course I didn’t do that. 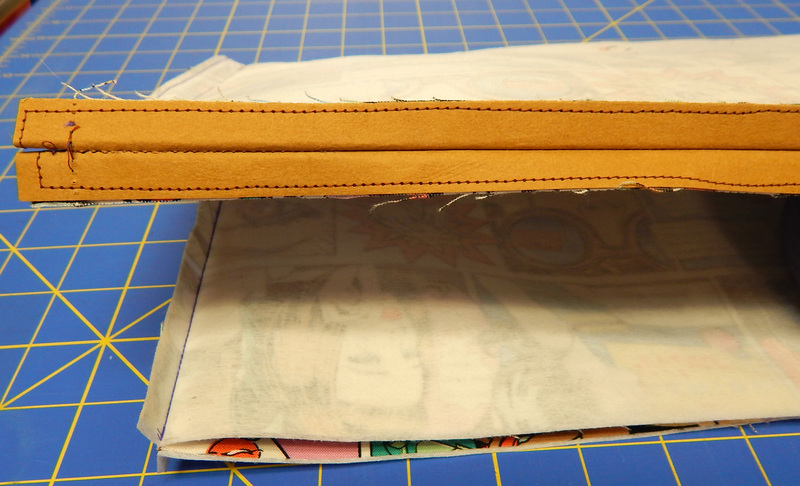 I cut the Kraft-Tex base 1/2″ narrower (top to bottom measurement) than Holly’s instructions, because the base on her bag is joined with a 1/4″ seam and then pressed back. I just appliqued the Kraft-Tex to the bag. Naturally, that required clips rather than pins–don’t want holes in the Kraft-Tex! 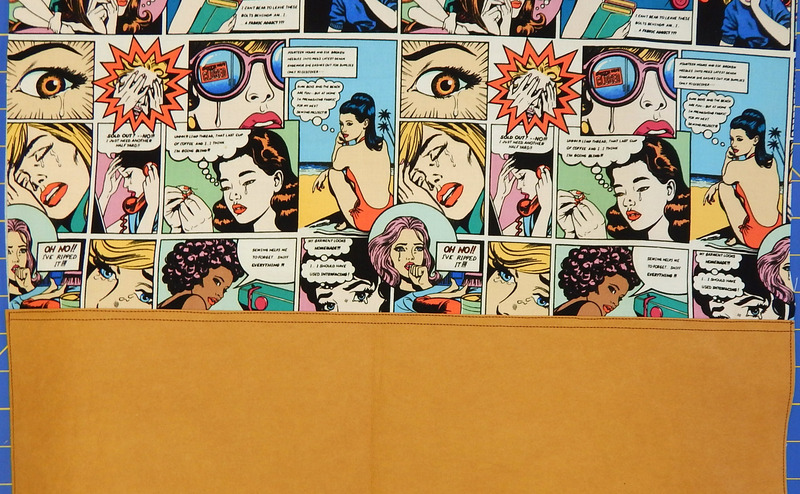 You can see that the fabric wasn’t printed entirely straight; the other side was straighter. Luckily, this bag is for fun. When it came time to press the seams open, I just folded back the seams that contained Kraft-Tex, then ran the handle of my scissors along the seam to crease the Kraft-Tex into place. The seams were not as bulky as I had anticipated, and gave me no trouble. The only difficult part was turning the bag right-side-out through the opening in the lining. The Kraft-Tex was a little stiff for that, but not too bad. I took out the top seams, inserted pieces of Peltex cut to fit, and stitched all around them. They needed to overlap the Kraft-Tex a little to make the whole thing stand up. That makes this “Holly’s bag with significant modifications”, but you can still get the measurements and construction details from her blog. I like the bag now, and it is a good size. Next time I’ll use Peltex from the get-go, probably still with the Kraft-Tex. 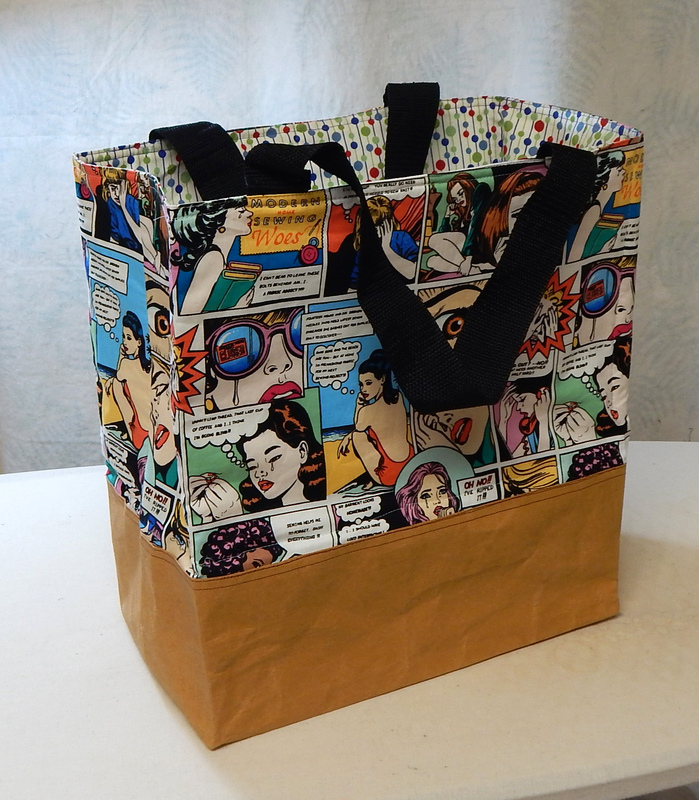 This entry was posted in Crafts, Sewing, Sewing projects, Tutorial and tagged bag, hand made bag, Kraft-Tex by zippyquilts. Bookmark the permalink. I anticipate that this bag is going to cause you to be late getting places, because people are going to stop you and read all the panels! And the very fact that you have it, announces to the world that you have a sense of humor, so they will feel comfortable approaching you. So cute! 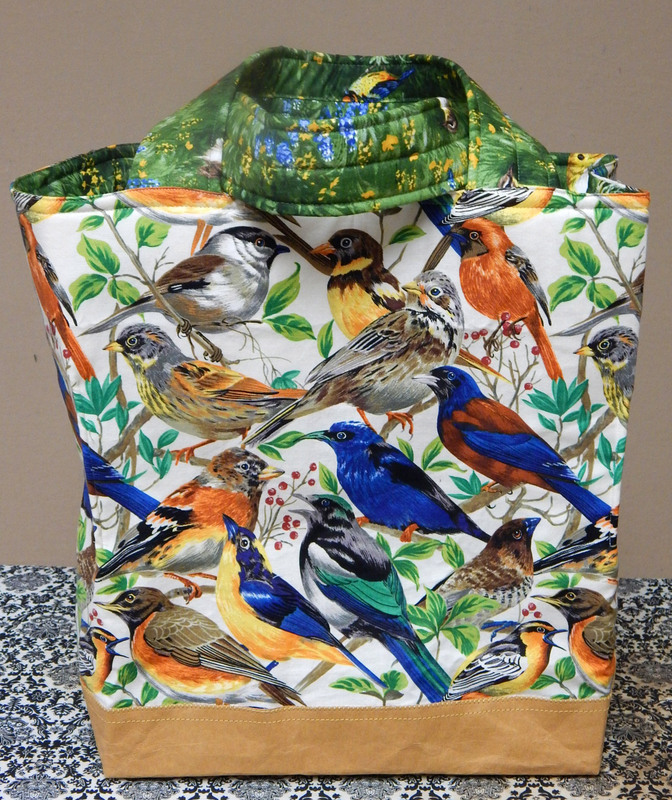 The bird fabric is gorgeous! And I love the Alexander Henry fabric. As a teacher, I could never have enough bags. It’s the same with quilters! Thanks for sharing the tutorial and your modifications. 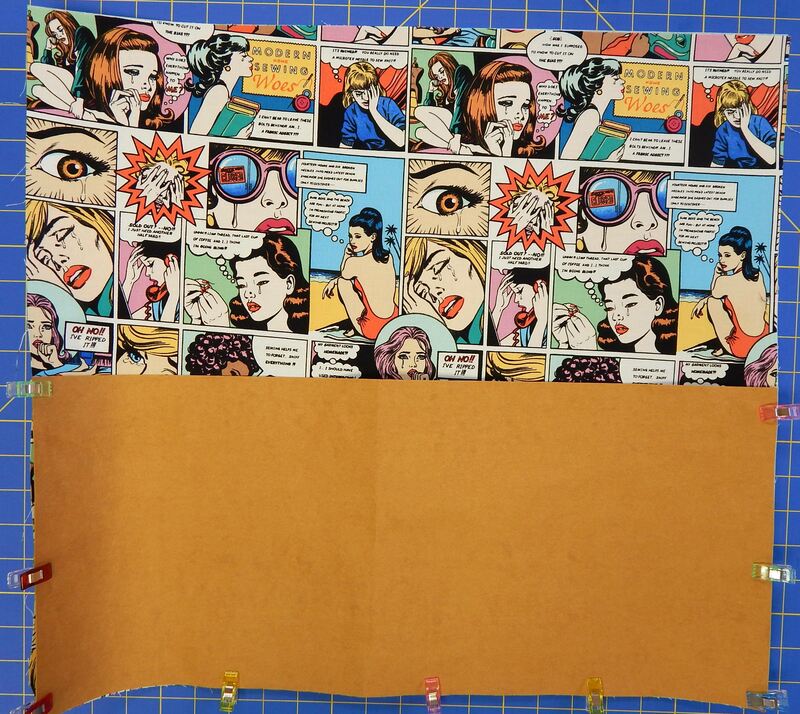 Do you think that Bosal fusible would work with this pattern? Yes. And I like using it for the handles, too, because it makes them comfortable to hold. Thanks. I am guessing that single -sided is best for this since there is a separate lining. Thanks. Just checking to make sure. An ‘engineering’ feat. And beautiful bags. I am most impressed. Hey Neighbor! Being a Bag Lady, I really enjoyed this fun and informational post. Where do you go fabric shopping? Maybe we can actually get together something ne this year. Hi Jeanne! I mostly shop where I teach, but I like to try new places, too. Have you been to the new shops in Weaverville or Hayesville/Murphy? We should go to one of them!